Is it snowing in Hoodoo Ski Area ?Thank you! 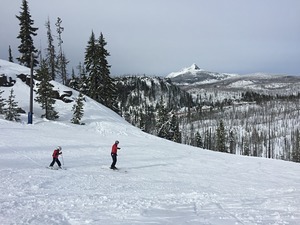 Hoodoo Ski Area in the United States (Oregon State) is a small ski resort with just 4 ski lifts (3 chair lifts, 1 surface lifts) but it does boast a respectable 316 metres (1037 feet) of vertical descent. Hoodoo Ski Area has 806 acres of terrain over 31 trails. Hoodoo Ski Area is best suited for intermediate skiers and snowboarders but there is a also a lot of terrain for beginners and experts too. There are 18.3 kilometers (11 miles) of cross country ski trails at Hoodoo Ski Area. For snowboarders, there is a terrain park. The closest airport is at Portland but the transfer time is 1.5 hours.